See https://www.researchgate.net/profile/Kartik_Ariyur/contributions for the most up to date contributions. 1. "Hierarchical TRIZ Algorithms," Larry Ball, Kartik B. Ariyur and Paul Dwyer, 3mpub.com, 2007. 2. "Wikinomics Playbook," recognized as one of the principal contributors in this mass effort at mass collaboration organized by the authors of Wikinomics, http://www.socialtext.net/data/workspaces/wikinomics/attachments/wikinomics:20080213154459-1-3411/original/the%20wikinomics%20playbook%2002%202008.pdf 2008. 1. "Cell phone geolocation via magnetic mapping," Y. Cui, R. An, and K. B. Ariyur, Automatica, vol.51, no. 1, pp. 70—79, January 2015. (to appear; available online at http://www.sciencedirect.com/science/article/pii/S0005109814004993). 2. "A hemispherical sun sensor for orientation and geolocation," J. Barnes, C. Liu, and K. B. Ariyur, IEEE Sensors Journal, vol. 14, no. 12, pp. 4423—4433, December 2014. 4. "Will the smart grid be stable: Approaches for supply-demand imbalances," Q. Luo, K. B. Ariyur, and A. K. Mathur, IEEE Transactions on the Smart Grid, vol. 5, no. 3, pp. 1361—1368, May 2014. 5. "Enabling operational autonomy for UAVs with scalability," S. H. Jung and K. B. Ariyur, AIAA Journal of Aerospace Information Systems, vol. 10, pp. 516—529, November 2013. 6. "A novel pressure feedback based adaptive control method to damp instabilities in hydraulic machines," D. Cristofori, A. Vacca, and K. B. Ariyur, SAE International Journal of Commercial Vehicles, vol. 5(2), pp. 586—596, 2012. 11. "Tailored Fuel Injection for Pulsed Detonation Engines via Feedback Control," A. Aliseda, K. B. Ariyur, O. Sarrazin , J. C. Lasheras, M. Krstic, AIAA Journal of Propulsion and Power, vol. 19, pp. 917-921, 2003. 1. "Behavioral modeling and optimal control of a PHEV mechanical drive system," N. M. Jali, R. T. Myer, R. A. DeCarlo, and K. B. Ariyur, submitted to the 2015 American Control Conference, Chicago, IL, July 2015. 2. "Electric machine vs mechanical brakes for traction control with real time extremum seeking control," S. S. Kuruppu, K. B. Ariyur, and N. A. Kulatunga, to appear in the Proceedings of the 40th Annual Conference of the IEEE Industrial Electronics Society, Dallas, TX, October 2014. 3. "Operational autonomy for UAVs with robustness," S. H. Jung and K. B. Ariyur, to appear in the Proceedings of the AIAA Infotech@Aerospace 2013 Conference, Boston, MA, August 2013. 4. "Operational and fuel efficiency for multi-UAV missions," S. H. Jung and K. B. Ariyur, to appear in the Proceedings or the AIAA Infotech@Aerospace 2013 Conference, Boston, MA, August 2013. 5. "Absolute orientation for a UAV using natural signals," C. Liu, S. H. Jung, and K. B. Ariyur, to appear in Proceedings of the AIAA Infotech@Aerospace 2013 Conference, Boston, MA, August 2013. 6. "System identification requirements for well-posed health monitoring in flight control systems," W. S. Black, J. Glassbrook, K. B. Ariyur and D. E. Adams, Oral only presentation in the AIAA Infotech@Aerospace 2013 Conference, Boston, MA, August 2013. 7. "Adaptive feedback linearization of nonlinear MIMO systems using ES-MRAC," P. Haghi and K. B. Ariyur, Proceedings of the 2013 American Control Conference, Washington D.C. June 2013. 8. "Inductive or magnetic recharging for small UAVs," T. S. Lee, S. H. Jung, and K. B. Ariyur, Proceedings the 2012 SAE Aerospace Avionics and Electronics Conference, 2012, # 12AEAS—0087, Phoenix Arizona, November 2012. 9. "Quantifying the security of physical facilities: A game theoretic framework," R. Singh and K. B. Ariyur, Proceedings of the 50th Annual Allerton Conference on Communications, Control and Computing, pp. 1368—1373, Urbana-Champaigne, IL, October 2012. 10. "Adapting first order nonlinear systems using extremum seeking," P. Haghi and K. B. Ariyur, Proceedings of the 50th Annual Allerton Conference on Communications, Control and Computing, pp. 1510—1516, Urbana-Champaigne, IL, October 2012. 11. "Construction of a sun sensor for orientation and geolocation," C. Liu and K. B. Ariyur, Proceedings of the 25th International Technical Meeting of The Satellite Division of the Institute of Navigation (ION GNSS 2012), pp. 3627—3635, Nashville, TN, September 2012. 12. "Compensating UAV GPS through use of relative positioning to a UGV," S. H. Jung, T. Mina, and K. B. Ariyur, Proceedings of the 25th International Technical Meeting of The Satellite Division of the Institute of Navigation (ION GNSS 2012), Nashville, TN, September 2012. 13. "Augmenting cell phone geolocation via magnetic mapping," Y. Cui and K. B. Ariyur, Proceedings of the 25th International Technical Meeting of The Satellite Division of the Institute of Navigation (ION GNSS 2012), 2469—2473, Nashville, TN, September 2012. 14. "Pedestrian navigation with INS measurements and gait models," Y. Cui and K. B. Ariyur, Proceedings of the 2011 ION GNSS, pp. 1409—1418, Portland OR, September 2011. 15. "Smart grid stabilization approaches," Q. Luo and K. B. Ariyur, Proceedings of the 2011 IEEE Multi-Conference on Systems and Control, 252—257, Denver, CO.
16. "Miniaturizing the spherical sundial: a hemispherical sensor for orientation and positioning with respect to point sources of light," J. Barnes and K. B. Ariyur, Proceedings of the 2011 IEEE Multi-Conference on Systems and Control, pp. 662—667, Denver, CO.
17. "On the Extremum Seeking of Model Reference Adaptive Control in Higher Dimensional Systems," P. Haghi and K. B. Ariyur, Proceedings of the 2011 American Control Conference, pp. 1176—1181, San Francisco, CA, June 29—July1, 2011. 18. "Bounding Inertial Drift in Personal Navigation with Gait Dynamics," Y. Cui and K. B. Ariyur, Proceedings of the IEEE International Systems Conference (SysCon 2011), pp. 28—33, Montreal, Quebec, Canada, April 3—6, 2011. 19. "Robustness for Large Scale UAV Autonomous Operations,"S.-H. Jung and K. B. Ariyur, Proceedings of the IEEE International Systems Conference (SysCon 2011), pp. 309—314, Montreal, Quebec, Canada, April 3—6, 2011. 20. "A Mathematical Foundation for TRIZ Methods," K. B. Ariyur, Proceedings of the IEEE International Systems Conference (SysCon 2011), pp. 409—411, Montreal, Quebec, Canada, April 3—6, 2011. 21. "Scalable Autonomy for Unmanned Aerial Vehicles," S.-H. Jung and K. B. Ariyur, Proceedings of the AIAA Infotech@Aerospace 2011(Unleashing Unmanned systems), AIAA 2011-1655, St. Louis, MO, March 29—31, 2011. 22. "Laplacian Path Planning: Implementaion and Generalizations," F. Yang and K. B. Ariyur, Proceedings of the AIAA Infotech@Aerospace 2011(Unleashing Unmanned systems), AIAA 2011-1631, St. Louis, MO, March 29—31, 2011. 23. "Deception Robust Control for Automated Cyber Defense Resource Allocation," J. Lawson, R. Singh, M. Hultner, and K. B. Ariyur, Proceedings of the IEEE Conference on Cognitive Methods in Situation Awareness and Decision Support (CogSIMA), pp. 56—59, Miami Beach, FL, February 22—24, 2011. 24. "Accelerometer Based Inertial Measurement Units," P. Gullipalli and K. B. Ariyur, Proceedings of the ION International Technical Meeting, pp. 244—249, San Diego, CA, January 24—26, 2011. 25. "The Safety of Autonomous Ground Vehicles as a Function of Sensing Capability," K. B. Ariyur and M. Mishra, Proceedings of the ION International Technical Meeting, pp. 1100—1101, San Diego, CA, January 24—26, 2011. 26. "Coalescence constraints for inkjet print mask optimization," J. William Boley, Kartik B. Ariyur, and George T-C. Chiu, Proceedings of the 2010 IEEE-ASME Conference on Advanced Intelligent Mechatronics, pp. 67—72, Montreal, Canada, July 6-9, 2010. 27. "Building thermal network model and application to temperature regulation," Qi Luo and Kartik B. Ariyur, Proceedings of the 2010 IEEE Multi-conference on Systems and Control, pp. 2190—2195, Yokohama, Japan, September 8-10, 2010. 28. "Motion estimation and navigational drift correction with LIDAR data," R. A. Balaebail and K. B. Ariyur, Proceedings of the ION International Technical Meeting, pp. 167—175, San Diego CA, January 25-27, 2010. 29. "Direct orientation and position measurements via magnetometers for miniature autonomous systems, " Isabelle A. G. Laureyns, Gautam Sharma, and Kartik B. Ariyur, GNC Challenges for Miniature Autonomous Systems Workshop, Fort Walton Beach, FL, October 26-28, 2009. 30. "The use of natural signals for localization and navigation with application to centimeter sized UAVs," Gautam Sharma, Isabelle A. G. Laureyns, and Kartik B. Ariyur, Proceedings of the 2010 American Control Conference, pp. 27—32, Baltimore, MD, June 30-July 2, 2010. 31. "Real-time energy management: cutting the carbon footprint and energy costs via hedging, local sources, and active control," Qi Luo, Kartik B. Ariyur, and Anoop K. Mathur, Proceedings of the 2009 ASME Dynamic Systems and Control Conference, pp. 157—164, Hollywood CA, October 12-14, 2009. 32. "Extremum seeking for model reference adaptive control," Kartik B. Ariyur, Subhabrata Ganguli, and Dale F. Enns, Proceedings of the AIAA Conference on Guidance, Control and Dynamics, AIAA 2009-6193, Chicago, IL, August 10—13, 2009. 33. "Region of attraction with performance bounds," Subhabrata Ganguli, Kartik B. Ariyur, and Dale F. Enns, Proceedings of the AIAA Conference on Guidance, Control and Dynamics, AIAA 2009-6191, Chicago, IL, August 10—13, 2009. 34. "On the Impact of Time Synchronization on Quality of Information and Network Performance," K. B. Ariyur, T. Schmid, Y. Yi, Z. Charbiwala, and M. B. Srivastava, Second Annual Conference of ITA, Adelphi, MD, September 2008. 36. "Analytic framework and QoS adaptive mechanisms for achieving transport capacity bounds in multi-hop statically routed IEEE 802.11 networks," S. Varadarajan, Y. Yi, K. B. Ariyur, Annual Conference of ITA, Adelphi, MD, September 2007. 37. "Safety Verification of Controlled Advanced Life Support System using Barrier Certificates,” S. Glavaski, A. Papachristidoulou, K. B. Ariyur, In Hybrid Systems: Computation and Control, LNCS 3414, pp. 306-321, Springer-Verlag, 2005. 38. "Reactive inflight obstacle avoidance via radar feedback," K. B. Ariyur, P. H. Lommel, D. F. Enns, Proceedings of the 2005 American Control Conference, pp. 2978-2982, Portland, Oregon, June 2005. 39. "Prediction of dynamic ground effect through modified lifting line theory," K. B. Ariyur, AIAA 2005-4610, Proceedings of the 23rd AIAA Applied Aerodynamics Conference, Toronto, Ontario, Canada, June 2005. 40. "Control Design for a Hybrid Dynamical System: A NASA Life Support System,” D. Subramanian, K. B. Ariyur, N. Lamba, R. Deshpande, and S. Glavaski, In Hybrid Systems: Computation and Control, LNCS 2293, pp. 570-584, Springer-Verlag, 2004. 41. 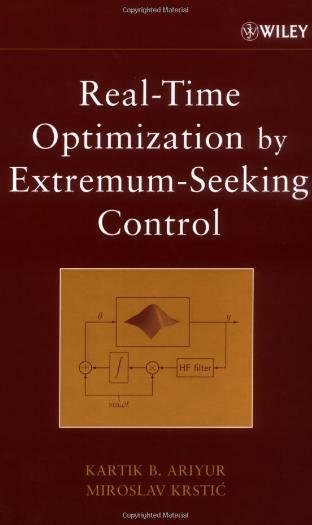 "Slope Seeking and Application to Compressor Instability Control", K. B. Ariyur and M. Krstic, 2002 IEEE Conference on Decision and Control, pp. 3690-3697, Las Vegas, NV, Dec. 2002. 42. "Slope Seeking in Equilibrium Maps of Nonlinear Systems," K. B. Ariyur and M. Krstic, Asian Control Conference, Singapore, Sept. 2002. 43. "Multivariable Extremum Seeking Feedback: Analysis and Design," K. B. Ariyur and M. Krstic, Mathematical Theory of Networks and Systems, South Bend, IN, Aug. 2002. 44. "Control of Formation Flight via Extremum Seeking,” P. Binetti, K. B. Ariyur, M. Krstic, F. Bernelli, 2002 American Control Conference, pp. 2848-2853, Anchorage, AK, May 2002. 46. "Stability of Extremum Seeking Control for a Class of Discrete-Time Systems,” J. Y. Choi, M. Krstic, K. B. Ariyur, J. S. Lee, 40th IEEE Conference on Decision and Control, pp. 1717-1722, Tampa, FL, Dec. 2001. 47. "Tuning of a Combustion Controller by Extremum Seeking: A Simulation Study,” G. Schneider, K. B. Ariyur, M. Krstic, Conference on Decision and Control, pp. 5219-5223, Sydney, Australia, Dec. 2000. 48. "Identification of Averaged Dynamics of a Controlled Combustion Instability,” K. B. Ariyur, A. Banaszuk, M. Krstic, Conference on Decision and Control, pp. 2017-2022, Sydney, Australia, Dec. 2000. 49. "A Case Study of Performance Improvement in Extremum Seeking Control,” E. Elong, M. Krstic, K. B. Ariyur, American Control Conference, pp. 428-432, Chicago, IL, Jun. 2000. 50. "Active Control of Blade Vortex Interaction Noise on a Helicopter Blade Element,” K. B. Ariyur and M. Krstic, Proceedings of the SPIE Conference on Mathematics and Control in Smart Structures, pp. 1053-1057, San Diego, CA, Mar. 1998. 1. "System and Method for simultaneous localization and map building," V. L. Bageshwar and K. B. Ariyur, US Patent No. 8478472, July 2, 2013. 2. "System and Method for simultaneous localization and map building," V. L. Bageshwar and K. B. Ariyur, US Patent No. 8340852, December 25 2012. 3. "Method for adjusting power at a node," K. B. Ariyur, US Patent No. 8200270, June 12 2012. 4. "Method to operate a wireless network having a predictable and stable performance," K. B. Ariyur, Y. Yi, and S. Varadarajan, US Patent No. 8107387, January 31 2012. 5. "System and method for GNSS position aided signal acquisition," B. Schipper and K. B. Ariyur, US Patent No. 8106822, January 31 2012. 6. "Method and device for three dimensional path planning to avoid obstacles using multiple planes," K. B. Ariyur, E. Lautenschlager, and M. R. Elgersma, US Patent No. 8078399, December 13, 2011. 7. "System and method for autonomous object tracking," K. B. Ariyur, S. J. Bedros, V. Morellas, US Patent No. 7907750, March 15, 2011. 8. "Method and system for performing distributed outer loop power control in wireless communication networks," K. B. Ariyur, US Patent No. 7899483, March 1, 2011. 9. "Method and system for autonomous tracking of a mobile target by an unmanned aerial vehicle," K. B. Ariyur and K. O. C. Fregene, US Patent No. 7765062, July 27, 2010. 10. "Real time planning and scheduling for a team of unmanned vehicles," K. B. Ariyur, D. P. Johnson, D. Subramanian, US Patent No. 7603212, October 13, 2009. 11. "System and method to perform stable distributed power control in a wireless network," K. B. Ariyur, US Patent No. 7603136, October 13, 2009. 12. "Trending system and method using window filtering," K. B. Ariyur and J. Jelinek, US Patent No. 7580812, August 25, 2009. 13. "Tracking a moving object from a camera on a moving platform," K. B. Ariyur, S. J. Bedros, V. Morellas, US Patent No. 7541565, June 2, 2009. 14. "Trending System", K. B. Ariyur, US Patent No. 7474992, January 6, 2009. 15. "Method for optimizing wireless data link capacity between mobile vehicles," K. B. Ariyur, S. S. Kazi, and C. Bommalingaiahnapallya, US Patent No. 7457619, November 25, 2008. 16. "Tracking a moving object from a camera on a moving platform," K. B. Ariyur, S. J. Bedros, V. Morellas, US Patent No. 7411167, August 12, 2008. 17. "Pilot Estimation using prediction error method switched filters," F. Abrishamkar, K. B. Ariyur, and K. Kreutz-Delgado, US Patent No. 7061882 B2, 13 June 2006. 18. "System and method for simultaneous localization and map building," V. L. Bageshwar and K. B. Ariyur, USPTO Publication No. 20100280699, November 4, 2010. 19. "Method for collision avoidance of unmanned vehicle with other aircraft," K. B. Ariyur, M. R. Elgersma, USPTO Publication No. 20100121574, May 13, 2010. 20. "Method and system for optimizing wireless networks through feedback and adaptation," K. B. Ariyur, S. Varadarajan, and Y. Yi, USPTO Publication No. 20090303888, December 10, 2009. 21. "Method to operate a wireless network having a predictable and stable performance," K. B. Ariyur, Y. Yi, and S. Varadarajan, USPTO Publication No. 20090245262, October 1, 2009. 22. "Method and device for three-dimensional path planning to avoid obstacles using multiple planes," K. B. Ariyur, E. Lautenschlager, and M. R. Elgersma, USPTO Publication No. 20090228205, September 10, 2009. 23. "System and method for GNSS position aided signal acquisition," B. Schipper and K. B. Ariyur, USPTO Publication No. 20090207076, August 20, 2009. 24. "Method and system for performing distributed outer loop power control in wireless communication networks," K. B. Ariyur, USPTO Publication No. 20090093267, April 9. 2009. 25. "Method and system for automatic path planning and obstacle/collision avoidance of autonomous vehicles," M. R. Elgersma, S. Dajani-Brown, K. O. C. Fregene, S. Pratt, K. B. Ariyur, USPTO Publication No. 20090088916, April 2, 2009. 26. "Method for adjusting power at a node," K. B. Ariyur, USPTO Publication No. 20090052371, February 26, 2009. 27. "High fidelity target identification and acquisition through image stabilization and image size regulation," K. B. Ariyur, V. Morellas, S. J. Bedros, USPTO Publication No. 20080118104, May 22, 2008. 28. "Method and system for detection and remediation of sensor degradation in a monitoring device," K. O. C. Fregene, K. B. Ariyur, USPTO Publication No. 20080046213, February 21, 2008. 29. "Static camera tracking system," K. B. Ariyur, S. Bedros, D. W. Strelow, V. Morellas, USPTO Publication No. 20070286456, December 13, 2007. 30. "Wireless sensor network with superconducting nodes," K. B. Ariyur, A. K. Mathur, USPTO Publication No. 20070249503, October 25, 2007. 31. "A calibration system," K. B. Ariyur, A. K. Mathur, USPTO Publication No. 20070107487, May 17, 2007. 32. "Controller for a life support system," K. B. Ariyur, R. Ghosh, S. Glavaski-Radovanovic, N. Lamba, D. Subramanian, USPTO Publication No. 20060278753, December 14, 2006. 33. "Map based trajectory generation," K. B. Ariyur, D. Subramanian, USPTO Publication No. 20060235610, October 19, 2006. 34. "Signal processing with certain materials,â€� K. B. Ariyur, USPTO Publication No. 20060160497, July 20, 2006. 35. "Collision avoidance involving radar feedback," K. B. Ariyur, P. Lommel, D. F. Enns, USPTO Publication No. 20060058931, March16, 2006. 36. "Prediction of dynamic ground effect forces for fixed wing aircraft," K. B. Ariyur, USPTO Publication no. 20050197811, September 8, 2005.